Successfully Added Classic Phone Dock with Handset for iPhone 4, Android Phones, 3.5mm Jack Phones (Executive Edition) to your Shopping Cart. Enjoy the good old days with this Old School Phone Dock, which lets you use a handset with your iPhone 4 or Android Phone. Combining old school style with new school technology, this phone dock is the perfect cool accessory for your iPhone, Android smartphone or any phones with a 3 channel 3.5mm earphone jack. Simply connect it to your phone’s audio jack and you will be able to relive the good old days. Enjoy the classic feeling of twirling the telephone receiver cord around your fingers as you chat happily with your family and friends. 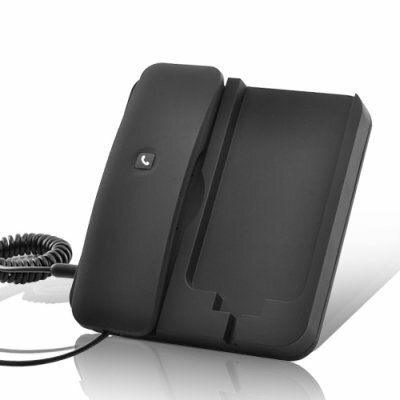 With its clean, professional look, it’s also suitable to use in the office for work phone calls! Minimize the radiation you’ll receive on those long calls to your loved ones. Think how much healthier this product will be for you, there’s a lot of fear about the radiation from mobile phones currently but mobile technology has already been adopted by society so there’s no going back. However buy the Old School Phone Dock with Handset now and you won’t have to worry again about all those surveys mentioning the dangers of mobile phone radiation. This awesome gadget is perfect as a cool little gift, or as a way to expand the functionality of your smart phone. Order yours today and we'll ship it out tomorrow, available from your source for cool high tech gadgets, Chinavasion. Compatibility: Made for the iPhone 4, but also supports other android mobiles or other phones with a 3 channel 3.5mm jack.